Teralyn Rose Pilgrim is hosting a fantastic fun contest over at her blog. I've been working on my WIP, the third futuristic story in the series that started with STARQUEST for far too long and I hope to get it finished and submitted to my publisher by the end of the year at the latest. I designed a cover to give myself inspiration when I rough drafted the story for NaNoWriMo (National Novel Writing Month) and when I heard of this fun contest I completely revamped it. Calling all Brigaders! 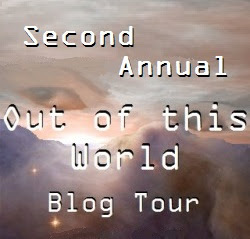 I'm currently organizing the second annual Out of this World Blog Tour, and I would love to personally invite my fellow SFR Brigade members to hop on board. Last year was a lot of fun, and with your help this year can be just as great! I will ask that each participant host one guest author and also write one guest blog (500-1000 words about some subject pertaining to your books story, theme, etc. ), as well as promote the tour via social networks. Missouri Romance Writers of America (MORWA) is proud to announce the opening of their annual contest – Gateway to the Best. With six categories, there’s sure to be one for your manuscript. As summer draws to a close, Gateway’s first round judges are waiting for your manuscript. Grand Prize: $100 & entire manuscript critiqued by published author. I announce the winners of the Duty and Devotion giveaway contest. It was so much fun. I love throwing these things! Contest Alert: Low Entries, Extended Deadline! Deadline extended and low on entries, the Heart-to-Heart for unpublished authors looks like a great opportunity! Note there's no synopsis required, a very reasonable entry fee, and the three final judges include an agent, a print editor and an e-book editor. Permission to forward or share the below information has been granted by the chapter. The 2011 Heart-To-Heart Contest sponsored by the San Francisco Area Romance Writers is running full speed ahead! We are low on entries and have extended the deadline to August 31st. ~ 3 final judges in each category! ~Entries will be accepted electronically ONLY. Save on paper and postage! ~Scoring based on 20 key areas guaranteed to make your entry shine! ~Contest entry fees will be accepted by Paypal or check! Contest for Unpublished Authors with SFR, Great Giveaway and Blog by Frances! There are only a few days left until the August 15th Deadline to enter the Golden Palm. We have a fabulous lineup of final judges so don’t miss out! Eligibility: The Golden Palm Cont! est is open to any writer who has never been contracted in book-length fiction (40,000 words or more) with any publisher. Great Giveaway at The Galaxy Express blog! Frances Pauli interviewed here. Please go give her some comment love Brigaders! Duty and Devotion has received many compliments, a couple ratings, and a super great review. To celebrate, I'm going to hold a contest and will give away a couple copies of Duty and Devotion... in whatever format you wish. Well, just contact me and let me know your favorite SF scene of all time, ever. (Ever, ever.) You can contact me either by leaving a comment here, leaving a comment on my blog (http://sci-fiadventures.blogspot.com/) or emailing me at ambernorris2000@yahoo.com. I will select the winners on the official R-Day of course, which is Monday, August 15th. Our own Frances Pauli is Guest Blogging about SpecRom! Check out her guest post here at Immortylrevolution and give her some SFR Brigade comment love! and big thanks to NPR for doing this!